Now that the world’s biggest tech companies have opened there, foreign governments are trying to get in on the action in Kendall Square, too. 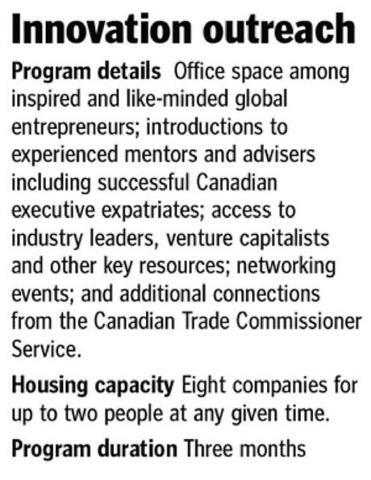 The Canadian government has launched a business accelerator program in Cambridge to help its most promising young start-ups tap into the expertise and energy of the growing innovation economy around the Massachusetts Institute of Technology, and ideally return home with new customers, connections, and ideas. Its program, beginning later this month, will include eight companies that each will spend three months rubbing shoulders with other entrepreneurs, tech executives, and venture capitalists at the Cambridge Innovation Center, which is home to about 500 start-ups and organizations. “It’s difficult to do that in Canada,” said Thierry Weissenburger, ­senior trade commissioner at the Canadian consulate in Boston. The bulk of the US innovation economy is centered around ­Boston, Silicon Valley, and New York City, with their clusters of ­information technology and life ­science companies and the venture firms that fund them. Canada lacks such epicenters, said Weissenburger, who has also established similar incubators in California and New York. “You don’t get the same concentration of ideas. There are just a few places in the world where you have that,” he said. The companies that will be visiting from Cambridge include Mindful Scientific Inc., a medical devices start-up from Halifax, Nova Scotia; Taste Filter, a music technology company from Montreal; and Equal6, a social networking company also out of Halifax. Andy Osburn, Equal6’s chief executive, will take up residence in Cambridge later this month in hopes of connecting with venture capitalists and new customers. Equal6 was launched in 2011 as a social networking site for college students to build professional contact lists and make inroads with potential employers. The site is working with Canadian universities and wants to bring its network to colleges across the border. Several other countries such as Britain and Switzerland have similar programs to connect their tech companies and start-ups with customers and potential investors in the United States, said Tim Rowe, chief executive of the Cambridge center. It may also lead to more American investments abroad. Since the Canadian government changed its rules limiting foreign investment about two years ago, venture funding from the United States into start-ups has climbed, said Chris Legg, a venture investor originally from Canada who works out of the Cambridge center. Part of the goal with the Canadian accelerator in Kendall Square is to build relationships among local venture firms and start-ups to the north, said Legg, who is part of a local business group made up of Canadian expatriates known as C-100 New England. It includes executives from local pharmaceutical and tech companies as well as venture capitalists.